Philips SHB8850NC review | What Hi-Fi? Just a little while ago, the cheapest noise cancelling headphones that were worth buying would set you back over £200. These days, though, it's possible to get noise cancelling tech from a pair of sub-£100 wireless headphones, such as the Phillips SHB8850NCs. Keeping the balance between sound quality, price, and additional features is no mean feat, but it's one that Philips managed with aplomb when it launched the SHB8850NC headphones back in 2016. Even now, this pair of noise-cancellers remains our favourite for the money. Style expectations are fairly low at this end of the market, so the fact that some people find these Philips headphones fairly flashy is to their credit, even if other observers are less enamoured by the shiny earcups and headband detail. Those earcups rotate and bend at the hinges so as to not take up much space in a rucksack or handbag, and while they feel a little flimsy next to newer rivals, the Philips pair we've been using since 2016 has lasted very well indeed. Those newer rivals have slightly realigned our expectations of comfort, though, and while the SHB8850NC headphones originally seemed quite comfortable for headphones costing under £100, there are now alternatives that are better suited to a long-haul flight. Still, turning on the noise cancellation is an easy task - just hold in the NC button on the bottom of the left earcup for two seconds, and a little green LED tells you when it is active. It's simple, and effective enough to mute most of the sounds of a busy office or the hum of a plane's engine, even if the mode does also introduce a little bit of hiss of its own. Once you have the headphones set up and ready to go, the SHB8850NC’s waste no time impressing you. Their 32mm drivers come full of surprises with clarity and detail much higher than we would expect from headphones at this price. Streaming The Who’s Baba O’Riley via Tidal, the opening synths are tight and organised, laying the stage for the drumbeat that merrily bounces right to left across the sound stage. The dynamics are powerful, too; your ears won’t be able to avoid pricking up at the first, striking piano chord in the song, which is introduced with a real physical presence. The headphones manage the rise of the song’s climax with ease and a notable smoothness. But the true quality of these headphones is in the way that they convey vocals. These Phillips are insightful enough to capture every little detail, and when Roger Daltrey starts singing you can hear the reverberations in every note. The SHB8850NCs make other impressive headphones, such as the Lindy BNX-60s, sound a little muffled in comparison. It’s not just classic rock that the Phillips are happy to handle, and if you’re looking to dim the lights and soften the mood you won’t be disappointed. Changing to Leonard Cohen’s Hallelujah, the headphones do a great job in conveying the sadness of the song. The Phillips direct the richness in the vocals during the chorus well, while keeping the bass guitar and bright chimes controlled. The SHB8850NCs are particularly potent in the midrange and the treble, and although they don’t reach down quite as much as we’d like on bass-heavy tracks, they’re still taut and responsive – still among the best for budget noise-cancellers. Our only other criticism is that the sound isn't quite as open and spacious as that of some rivals. Still, the class-leading punch and dynamism on offer largely makes up for that relative shortcoming. 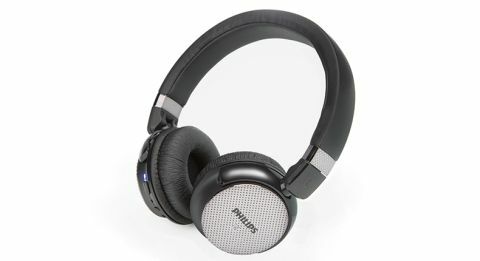 The Phillips SHB8850NC are a pair of headphones that bring a lot to the table without taking a lot from your wallet. They’ve got a lot of punch and a great deal of nuance, even over Bluetooth, and while some newer rivals trump them for comfort and sonic spaciousness, those core audio qualities and excellent portability will satisfy anyone in the market for a good pair of budget noise-cancelling headphones.